Won't You Read My Sign? American Folk Rock Revival with inspirational vocal harmonies, beautiful guitar work, and socio-political lyrics. 1. Won't You Read My Sign? "Won't You Read My Sign" is a portrait of a person at a rally, holding a sign, considering injustices faced in real life, and through their digital life. 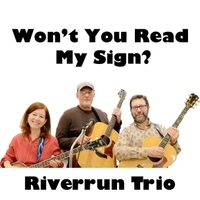 The Riverrun Trio Folk Rock Revival is the product of an 18 year evolution. We have recently crystallized our vision and our focus is blending of our voices and guitars to create beautiful sound. It all began in the back of Riverrun Rare Books in Hastings-on-Hudson, NY. There had been a long history of musical gatherings and hootenannies there from the 1960’s and 70’s. Ken Tuccillo was friends with Louisa Stevens, who was one of the owners of the book store. She agreed to let Ken host local musicians on Monday evenings. Among those participating those early days were Joan & Ben Indig. In 1997, Adam Hart was organizing a local grass-roots festival to save the lower Burke Estate in Hastings from developers. After hearing through neighbors about the Riverrun jam sessions, Adam showed up one night and invited the people there (Ken, Joan & Ben, Peter Berley, Ed & Coleen Pitarro, Chris Martin) to play the festival. The initiative worked, the Burke Estate was saved through a village bond issue! Adam then joined the jam sessions as a drummer (too many other guitarists!). In 1998, FOWCAS (Friend of Wickers Creek) in Dobbs Ferry invited us to play a benefit to save a Native American site from developers. There were seven or eight of us playing that night, including Adam, all the people above and Susan Billenker We had a great time and were asked to do several other events in the next year. During that time, those who were unable to commit to the shows stopped coming. The informal jam was over. 1999 was the year Jeff Dyke and Adam Hart became friends through their kids. Adam invited Jeff to sit in with Ken and Joan. It worked well. We cut our first CD in 2000 at The Muzic Center in Dobbs Ferry, and won a battle of the bands at The Bayou in Mount Vernon. 2001-3 was filled with raucous rehearsals and lots of bar gigs as an eclectic rock band at places like Kenny’s Castaways, Le Bar Bat and The Bayou . We essentially went electric. Joan then developed tinnitus, a condition of the ear that causes ringing. She graciously stepped out of the band. It was too loud for her. In 2004, David Howe joined us a bass player, replacing Joan. David’s talent as a player took the band to a different direction, adding a funky energetic sound. Mark Kaufman, a jazz horn player joined the group as well, and we all made great music together for a several years, cutting our second CD “Undertow”. As bands go, this combo had a good run until 2008. Adam & Ken couldn’t stop though. They continued as a duo. In 2013, Adam hosted a night of music at the Upstream Gallery (at that time it was in Dobbs Ferry, now in Hastings). He and Ken invited Joan to join them in an acoustic combo as one of the many acts that night. It was magical. We did two more shows together like that, doing 5 songs as a trio each night. Then we met and decided that among all the combinations of people we had played with, this one felt the best. The result is a trio of authentic folk rock with great harmonies and meaningful and memorable songs. Our repertoire is diverse, including Pete Seeger, Neil Young, Traffic, Beatles, The Band, and a number of contemporary songs as well as original compositions in and out of the several genres. Although our sound has a quieter, gentler blend, there is a grittiness inherent in the genre that gives an active living quality to the songs, and often questions the world around us in order to take action and help make the world a better place.